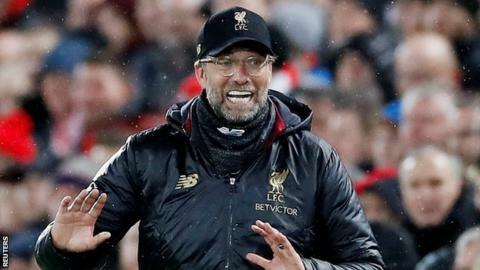 Manager Jurgen Klopp said it is "mad" to suggest a Champions League exit could help Liverpool's bid for a first domestic title in 29 years. The Reds are a point behind Manchester City in the Premier League and face Bayern Munich on Wednesday after a goalless draw in the last 16 first leg. "I don't think any other coach has to answer this question," said Klopp. "It only happens if you're Liverpool manager and the pundits come from Manchester United." Klopp guided Liverpool to the Champions League final last season but former United defender Gary Neville suggested losing in Germany could do them a "favour" in their attempts to win a first title in the Premier League era. "They [pundits] talk constantly," added Klopp. "It doesn't mean they make more sense because of that. That's the problem. "It is so easy to sit in an office or a studio and talk about things like that. "We don't draw up a season and say the best way to go through it is to go out of all the cup competitions early. "You do that and in that moment the same people go for you like mad. "Now it is closer to the end of the season and it is allowed to go out of the Champions League without even trying to go through? That's really mad. "I am not angry about it. It's just so mad that I constantly get confronted by it." Klopp highlighted the Champions League's importance to his plans for building the club, while describing the tournament as a "money-throwing competition". A run to last year's final earned the Reds about £72m, which contributed to a £106m world record profit. "We all have to qualify constantly for the Champions League - that's what gives us the money to improve," he said. "When we qualified [for the knockout phase] by beating Napoli I'm unsure how much we earned - a lot in one game." The sum was £8.1m in addition to about £23m, excluding additional television revenue, accumulated from their efforts in the group stage. If Liverpool reach the quarter-finals they will receive an additional £9m, and progression to the final would be worth another £23.6m. Klopp said: "It is a money… what is it? It is a money-throwing competition and we have to be in it as long as possible because we have to improve the situation for the club. "We have to earn most of the money for ourselves with the football that we play. That is exactly what you can do in the Champions League."